Dolfab Metal Fabricators and Metcalf Marine Exhaust recently collaborated on 164′ Delta marine M/V Helios 3 to conduct much needed repairs to the exhaust system. It was discovered the Helios 3 was suffering from leaks in the exhaust system. 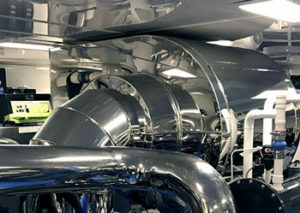 The exhaust system on a super yacht like this is truly an enormous, impressive thing. In order to be able to access it for diagnosis and conduct necessary repairs, we had to disassemble the system in stages: one whole day and a half was allocated to dismantling it and three days to put it back together. Upon dismantling the system, the team from Metcalf Marine Exhaust was able to go in and remove the insulation within the exhaust. 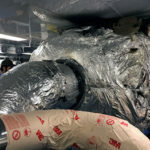 With the insulation gone, the Metcalf team then conducted several pressure tests in order to locate the leaks. Once the leaks were located, the Dolfab crew was able to go in and make the necessary repairs to the super yacht’s mufflers. After the repairs were complete, Metcalf reapplied insulation and then Dolfab reassembled the entire shroud system, repolishing all of the exterior components as needed to maintain yacht-quality #8 mirror finish. This stage took three days to complete. The result is a like-new, polished marine exhaust that works and is befitting of the Helios 3. Truly a fantastic collaboration between marine repair professionals. Dolfab Metal Fabricators is an expert in yacht repair, yacht refits, boat repairs, custom metal, Coast Guard certified custom fuel tank and fuel tank repair, T-Tops, RV repair, and an absolute expert professional with all metal fabrication. We are based out of Pompano Beach, Florida and service all of South Florida.